・Performance of various ophthalmic tests for general purpose; corrected visual acuity test, measurement of intra-ocular pressure, visual field assessment, imaging test, etc. ・Performance of investigative tests of amblyopia and strabismus for adults and children. Most children eventually recover from amblyopia by around age 8－10 if they could receive the benefit of patches and corrective glasses. ・Performance of screening tests and health examinations. ・Low vision aids on the use of magnificatory amblyoscopes and other strategies. Reference: The Report of actual condition and future prospect of Japanese orthoptits in 2010 year: The white paper committee of JACO. JACO,Tokyo,Japan. 2011. In Japan, Orthoptists are nationally certified by the Japanese Orthoptists Law enacted in 1971. There are actually 10,681 licensed (certified) orthoptists in Japan according to the Ministry of Health, Labor and Welfare reports of April 2012. Eight universities, twenty-one professional schools and six postgraduate schools have been providing orthoptic training programs in Japan. Why so many schools we have? Because of the orthoptist is the only nationally licensed co-medical profession in the field of ophthalmology in Japan. The Japanese Association of Certified Orthoptists was established in 1971, and incorporated under Japanese law in 1988. The number of our members is approximately 5,100 orthoptists as of September 2010. We provide periodical trainings and educational opportunities for them. Our activities have been contributing to improve the members’ skills and services toward development of a better quality of orthoptic technique in Japan. These activities continue to improve medical care services and, as a result, contribute to a better quality of medical technique for keeping Japanese citizens’ precious eyes healthy.The Japanese Association of Certified Orthoptists composes of the voice of our members and the organizations related to the ophthalmic field in the world. We continue to make every effort to carry out our mission in Japanese society. Start of modern Strabismus of Japan. Ophthalmologists who did strabismus studies in the US and visited ophthalmic institutions in Europe introduced the principles and practice of orthoptics to Japan. 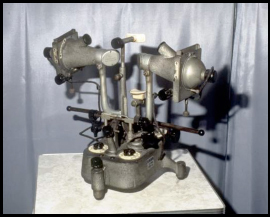 Dr. Anderson contributed two major amblyoscopes to Japan. A group of 22 orthoptists held the first professional conference. 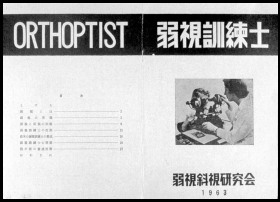 The Orthoptists Law was established in Japan and the first National License Examination for orthoptists was administered by the Ministry of Heath, Labor and Welfare. The first Japanese training school for students was opened in Tokyo, Japan. The Japanese Association of Certified Orthoptists was established. The Japanese Association of Certified Orthoptists joined the International Orthoptic Association. A corporate juridical person became a part of The Japanese Association of Certified Orthoptists. 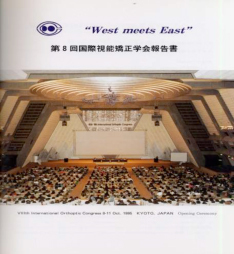 The 8th International Orthoptic Congress was held in Kyoto, Japan. The Japanese Association of Certified Orthoptists celebrated the 30th anniversary of its establishment. The Japanese Association of Certified Orthoptists launched the Continuing education programs for orthoptists. If you have any further questions or requests, please do not hesitate to contact us.